Ecosensual History: Hedonistic Priciples of Sensual Birth Control! An EcoSensual Approach to Birth Control! Most forms of natural birth control on the market are about as exciting reading a medical journal! Our website is designed to not only allow a woman knowledge about her fertility but also to give her options and control over her love life. In this brief Ecosensual history we describe our enjoyable search to provide a reliable form of birth control which allows a woman and/or couple to change their way of making love to reflect a female's natural cycle. Why is sensual contraception great for couples or single women? Birth control in essence is about relationships and sexuality. Many couples today have difficulties in those areas. After all, even the most loving couples fall into predictable sexual routines and patterns as the years go by. The Ecosensual Natural Birth Control Methods are designed to give them a choice. It allows a couple to vary and revolve their love life around a woman's natural cycles to allow for the possibility of having an exciting and varied love life that is more in tune with nature. Mojo Mustapha is the Community Director of the Hedonisia Hawaii Sustainable Community which manages this website as part of its Eco-Feminist Entrepreneur Portfolio. At our eco-community, we work on the basis of 'Pleasurable Activism'! We create entrepreneur projects that serve social and environmental goals. However, we make sure that we enjoy life along the way. Pleasure with an ethical foundation provides fuel and motivation for our efforts! In addition to his work at the community, Mojo has traveled to 36 countries and has completed workshops on Human Sexuality in Holland, Australia, India, Germany, USA, Canada, and Denmark. I define myself as a ‘cynical idealist’. I’ve committed my life to making this world a better place on a practical level through the businesses I’ve started and hope to inspire and educate others to do the same. However, I’m cynical in that I’ve realized that many people do not match their actions with their words especially when it comes to ‘big picture’ issues. In all the entrepreneur projects I work on, we make money from our ideals. 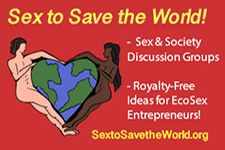 EcoSensual is part of this effort to show that you can make money by making the world a better place!